Barnard College required assistance in quickly bringing information online and wanted to publish content available in the print version of their magazine on the Barnard College website. In addition, they sought to make their website more engaging and to continually enhance that web presence. Barnard College partnered with Unleashed Technologies to have its experienced developers and designers serve as an extension of the Barnard College web team. Unleashed Technologies worked closely with the Barnard College to establish the correct Support and Growth package for their needs. At first, a 40-hour package was selected to meet the goals initially outlined. Unleashed Technologies adapted to their existing system by reusing content types and making edits to existing templates where possible, saving time and money. As work commenced on the college’s online publication, a new priority was established for the web team: a web presence to celebrate the 125th anniversary of Barnard College. Because of the flexibility inherent in the Support and Growth package, Unleashed Technologies was able to shift priorities and refocus its team on the new web presence. In order to meet established deadlines, the Support and Growth package was increased from 40 to 80 hours per month. 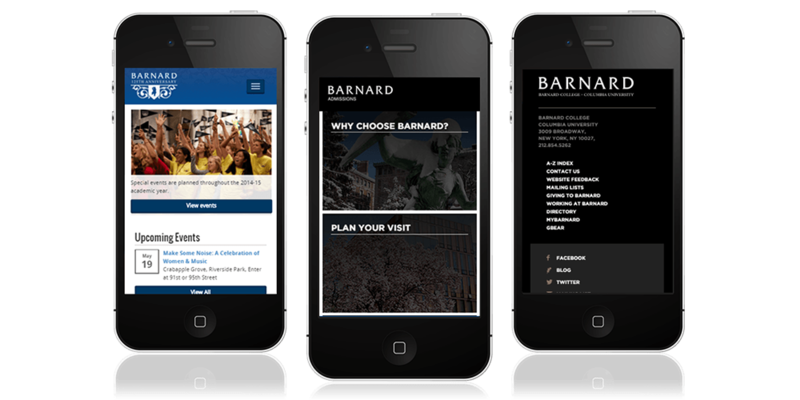 Unleashed Technologies and the content managers at Barnard College worked together to create a highly specialized website to highlight the rich history of the college. A featured part of this 125th Anniversary website includes a dynamic “Memories” page. This page was created to share contributions by people who are associated with the college, including students, faculty and alumni. Visitors to this dynamic page can filter through memories based on their unique interests and the time period. For sharers, content is submitted via an online form and content editors are then able to review, format, and publish. Increased the amount of user contributed content across their current web presence and tying that into a new web presence for their Admissions site, which is launching soon. Will soon deliver a responsive mobile experience so that visitors can access their website from any device (launching soon). 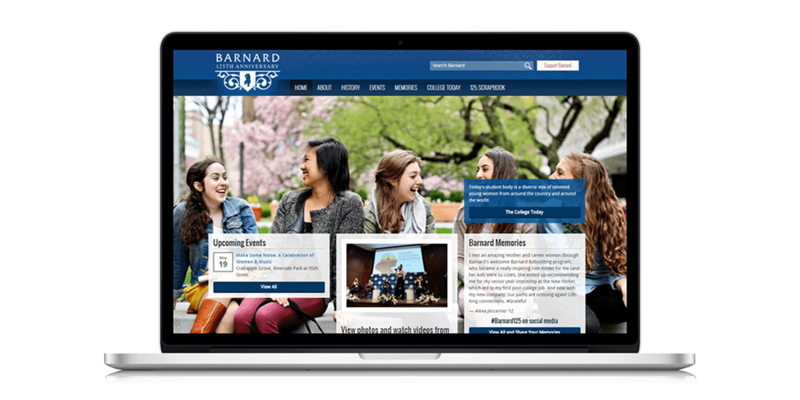 Barnard College has several initiatives in process following the successful launch of the 125th Anniversary site, among them the online publication project initially budgeted for. Because of the flexibility of the Support and Growth package, Barnard College was able to reorganize its priorities within the terms of that package and achieve the newly set goals without incurring unexpected costs. 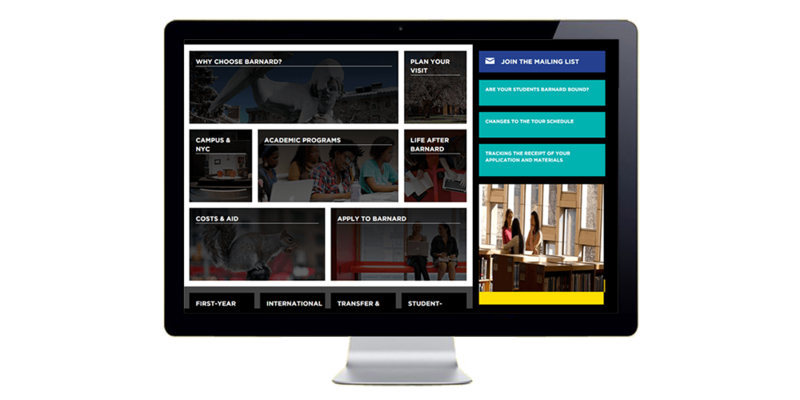 This agility has empowered the Barnard College web team to increase engagement and improve the online experience for visitors.